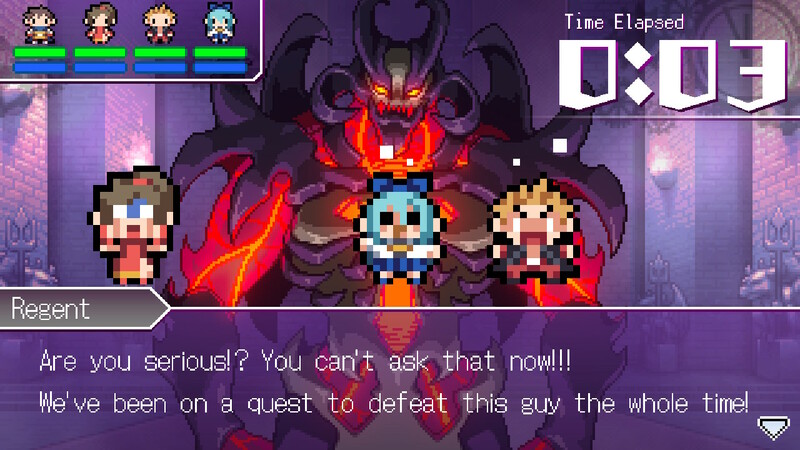 The Longest Five Minutes looks like your typical JRPG, only it starts at the final boss. Our party has travelled the world, fought a great many monsters, made friends, helped people, and now they’re finally ready to take on the Demon King. And then, just as the battle starts, our hero is struck with a sudden bout of amnesia. He can’t remember who these people are beside him, nor how he came to be face to face with this very angry and powerful villain. As you can imagine, that’s somewhat inconvenient when you’re trying to stop a great evil and save the world once and for all. If he wants to have any hope of surviving, let alone winning, Flash Back—yes, that’s our hero’s name—will need to find some way of restoring his memories, and quickly. 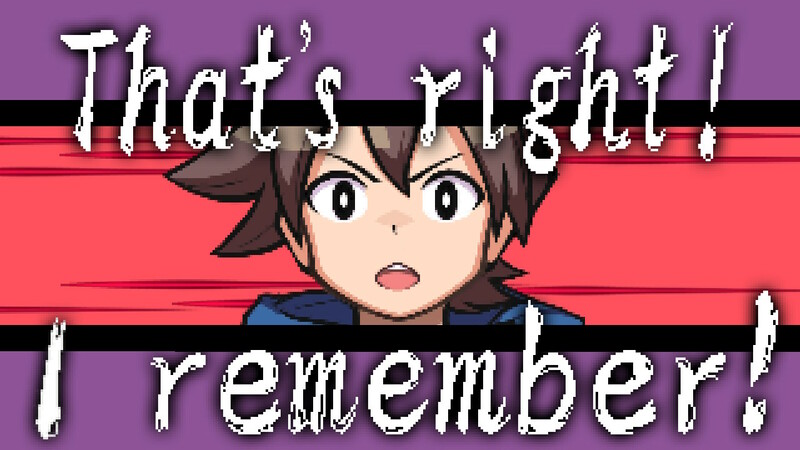 It’s a rather brilliant spin on one of the most well-worn tropes in JRPGs: the amnesiac hero. Aside from being a great source of humour, it sets up the basic framing of The Longest Five Minutes: most of the story plays out through Flash’s memories as he pieces them back together, with little interludes in the present in which he’s able to put what he just remembered to good use. Through these memories, a very classic but very earnest story unfolds. Four heroes (and a few more who join along the way) set out to investigate a weird fog that’s caused a spike in monster appearances, and gradually get swept up into a fight with the Demon King, with the future of the world at stake. Each of these heroes has their own motivation for taking up the task, and each goes through their own Hero’s Journey along the way. Ultimately, it’s their friendship and unity carries that them through—another frequent genre trope, but The Longest Five Minutes is so genuine in its telling that this builds up to be an emotional adventure all the same. The flashbacks play out in classic JRPG style: you speak to people in towns, buy the best weapons and armour you can afford, and then venture out across a world map to whatever dungeon awaits you, all as a means of driving the story forward. There’s chiptune music and a retro pixel art style to match—not quite 8-bit, but with the look of early SNES like Final Fantasy IV that were far from pushing that console to its limits. The difference here is that the flashback framework takes that grand, world-spanning adventure into bite-sized chunks, with individual memories ranging from a few minutes to an hour or so at most. It’s an easy game to compartmentalise and play in bursts—perfect for a handheld console the Switch, where you can play a memory or two in the span of a train ride, without the need to leave something half-finished. Each memory has predetermined character levels—a necessity, given the non-linear sequence you play them. At the same time, there’s an overarching progression system in “reexperience levels” (because Flash is reexperiencing these memories, geddit?). The actual level of each character in a given memory is a combination of their static RPG level and their reexperience level. Similarly, things like items and money are confined to each flashback, and nothing you find, buy, or grind for carries over to the next one. The benefit of this is that you can freely use your items and money without restrain, knowing that there’s nothing to gain later on by hoarding. At the same time, it can make equipment feel valueless, to the point where I found myself not bothering to fully explore dungeons and only opening chests I happened to stumble upon. In true classic JRPG style, random encounters are frequent, with a simple turn-based combat system. This is enjoyable at first, but the frequency of encounters can get tiresome, particularly towards the end of the game when the dungeons get much bigger. There’s not much need for strategy in regular encounters—standard attacks and the odd healing spell work perfectly from start to finish—but the auto-battle function is a lot slower than simply mashing the A button through every fight. Bosses, at least, allow for a bit more creativity, mostly because they have big enough health bars to make using magic worthwhile. The delightful monster designs do make battles worthwhile, at least until you’ve seen all that a particular dungeon has to offer. 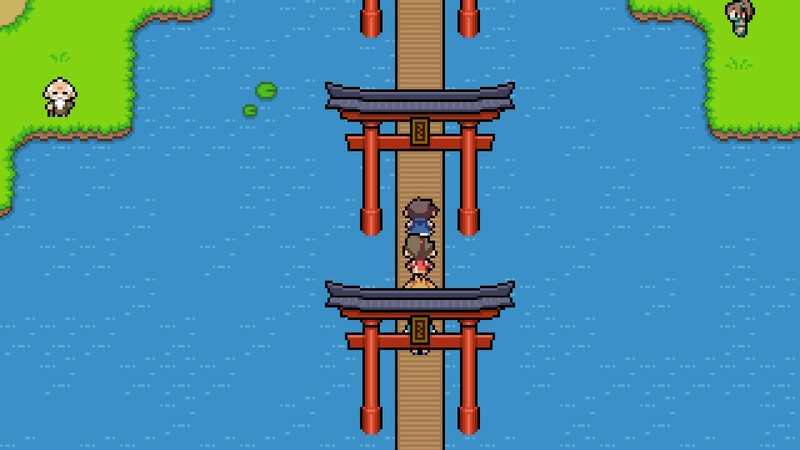 By the game’s story, the evil fog spreading across the world can turn anything, animate or not, into a demon. The result is all manner of strange creatures to fight against, from wine casks to pianos to a hole in the ground. 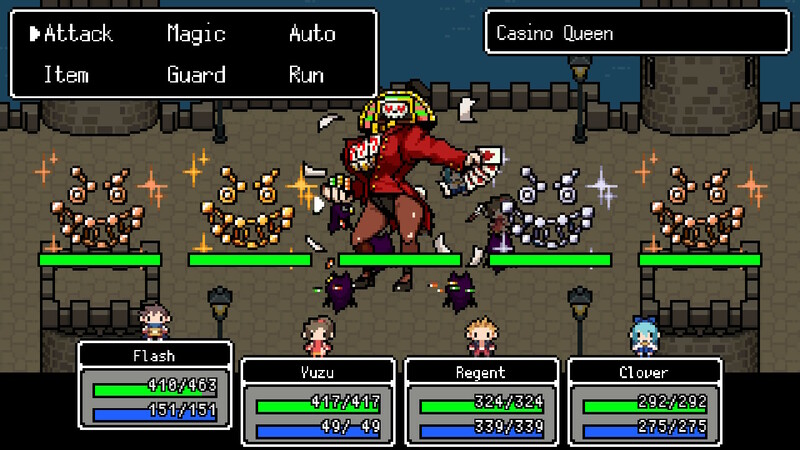 The pixel art really fills these enemies with personality, too—a particularly impressive feat when they’re all static sprites with no animation to speak of. In the present-time interludes, meanwhile, The Longest Five Minutes becomes more akin to a visual novel, while retaining that retro RPG dressing. You can see your characters’ HP bars on-screen, you see damage numbers pop up, but you don’t actually fight. Instead, the battle plays out before your through a lot of dialogue scripted attacks, and you—as Flash alone now, rather than someone controlling the whole party—make dialogue choices that lead to small but significant branches in how the story plays out. These interludes also show a timer of how long this battle with the Demon King has been going on. (This too is scripted, so don’t worry about being rushed or taking time to read the text boxes—the timer isn’t in real-time.) As you might expect from the game’s title, the fight takes five minutes of in-universe time, but between all the flashbacks and the fact that the interludes alone add up to a lot more than five minutes real-time, it’s a long five minutes indeed. That all builds up to make The Longest Five Minutes a delightfully charming little game. The central conceit is a clever twist on a very tired trope, setting up a simple but heartfelt adventure that looks wistfully back at a simpler time. If you enjoyed this review and plan to buy The Longest Five Minutes, you can support Shindig by using this affiliate link. The Longest Five Minutes is developed by Nippon Ichi Software and published by NIS America. It’s available now on Switch (reviewed), PS Vita, and PC.